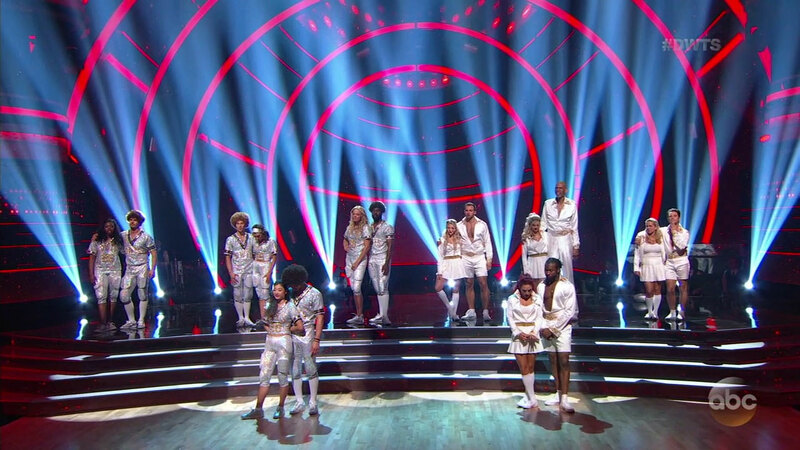 LOS ANGELES -- Eight remaining athletes faced the challenge of a double-header this week on "Dancing with the Stars." They each performed one individual dance along with a team dance. The team dance scores were combined with the individual dance scores, along with the previous week's overnight votes, for a final tally to determine the two eliminations for round two. "Dancing with the Stars" champion Rashad Jennings returned to the ballroom as a guest judge, alongside Len Goodman, Bruno Tonioli and Carrie Ann Inaba. Host Tom Bergeron started the round with the best line of the night, when he made reference to this being week two, and we're half way through the competition. And, we saw our first 10's of the season! Mirai was sad, and a little mad, at getting one 7 from the judges during the first week. Alan challenged her to go full-on athlete and work hard to fix what's needed. He also distracted her with a trip to Disneyland and that brought a smile to her face. Head judge Len said Mirai was sprinkled with Disney magic this week and the Foxtrot was the best dance in the competition so far. Bruno thought she embodied a fairy princess. Carrie Ann said Mirai showed us this week what she is capable of doing, and Rashad praised the choreography and said the dance felt graceful, peaceful and...worthy of a 10! He tied his "Stars on Ice" partner, Mirai, and that surely thrilled both of the skaters. Adam admitted to having a hard time this week, both because the Quickstep is hard to learn and he's traveling the country with his skating commitments. Jenna is right there beside him on the road and they practice whenever they can find an open space and a few minutes. All four judges were thrilled to see what they brought to the ballroom and praised their chemistry, partnering, timing and clarity. Chris seemed to have razor-sharp focus and he told us why: he has ADHD. He told Witney the only way he can master anything is to focus...but not for too long! She's learning how to train him in the best way for his needs and it's clearly working. Len liked their sway and Chris' heel leads in their Viennese Waltz. Bruno thought they used the space well and complimented him for getting rid of his "claw hands" from week one. Rashad thought Chris did an amazing job, and Carrie Ann called the routine nuanced and full of finesse, but it also told a good story. Tonya's Quickstep song is a country favorite "Redneck Woman" and she not only loves it - she lives it. She's also enjoying every moment of this journey and said it had made her feel alive again. Her costume included cowboy boots, which can't be easy to dance in and there's also a super distracting bear chasing them around their campsite scene. But the key word here is fun. Len liked the energy they brought to the floor and said Tonya has a "feel good factor." Bruno praised their high energy and spirit, but warned her again about "losing her neck." Carrie Ann liked the tone and her partnering with Sasha. The basketball player took some knocks during week one because she didn't wear proper dance shoes. She changed her tune for week two and tried on her first pair of heels. It added another layer of challenge but, ever the athlete, she overcame her weakness. Gleb choreographed a lovely, soulful Foxtrot and she was a new dancer! The judges all took notice of the transformation and praised her power, poise and ability to perform under pressure. Josh and Sharna did what looked like a picture perfect Paso Doble and, again, it's only week two! Len said he was expecting a dip in performances from everyone this week because of the schedule, but he thought the Paso Doble was equal to last week's Cha-Cha. Bruno loved his power, but warned Josh about paying attention to his hand movements. Carrie Ann agreed and suggested he focus on using his arms to their full potential. Kareem introduced Lindsay to the music that influenced him when he was a young boy growing up in Harlem - lots of Latin and island influences that will work well for the Salsa. The dance started out with Lindsay sitting on another dancer's shoulders (we learn later it's Hayley) so she can finally see eye to eye with Kareem. It's a little unsettling at first (kind of like the bear in Tonya's routine). But Lindsay got back to her 5-foot-4 self for most of the dance. Kareem did move a bit more than he did the first week, so that must count for some points in the area of improvement. Len did say there was more content and thought Kareem brought the party to the room. Bruno told them the dance was clever and well-constructed, and Rashad said Kareem could stand tall with that performance. Jennie threw her partner Keo a curveball mid-week when she told him she's not comfortable with the song they have been assigned. A press release listed Janelle Monae's "Make Me Feel" as their tune. They ended up doing the Cha-Cha to Daphne Willis' "Do It Like This." The late music switch may have hurt them - their scores, and the judges' comments, weren't the best. Len wanted things to be sharper. Bruno was bothered by her hands and their lack of movement. Carrie Ann agreed she needs to extend more and connect more with the music. Rashad sympathized because he knows this is a difficult dance. Then it was time for the team dances. Not sure how they came up with these themes and songs, but my colleague and I think maybe the producers were tired and a little punchy and just spun the wheel of wacky ideas. Team 1950's Tennis saw a routine to Britney Spears' song "Baby One More Time," sung in a sort of Elvis style. Chris, Josh, Kareem and Tonya were part of this tennis club and the judges gave them 33 out of 40 points for their efforts. Team 1970's Football used the song "Instant Replay" and was made up of Adam, Arike, Jennie and Mirai. The judges were blown away, with Rashad even giving them a 10, and an overall score of 37 out of 40. A quick elimination ended the two-hour show, with Tom announcing Kareem, Chris and Arike were all in jeopardy. In the end, Chris was safe to dance again and Kareem and Arike left the ballroom.